YOUNGSTOWN, Ohio – Youngstown State University is launching a program in local school districts that would teach students to think differently about business and be better prepared for the workforce upon graduation. 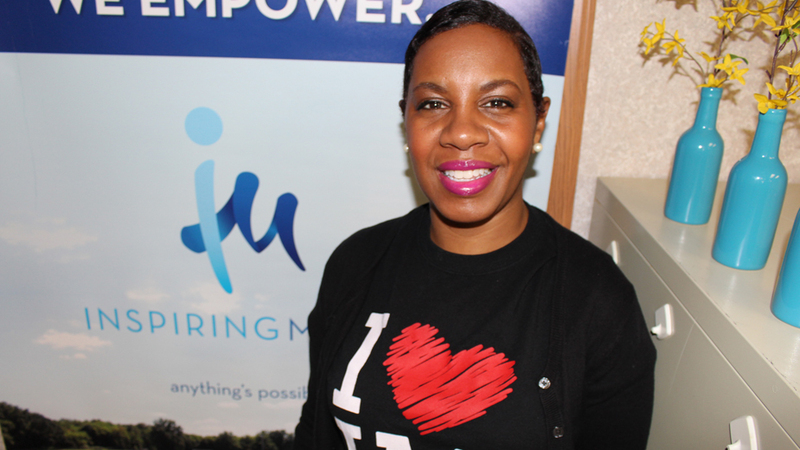 Smith, the entrepreneur coordinator of the Center for Human Services Development at YSU, was hired in January 2017 with the creation of the Ohio Youth Entrepreneurship Program, or OYEP. The program supports the study of entrepreneurship for students from kindergarten through grade 12 and goes beyond just teaching how to write a business plan. “It’s more focused on how to create an entrepreneurial mindset in students,” Smith says. The state of Ohio funded the program in July 2016 through the Ohio Department of Higher Education. YSU was awarded a discretionary grant to develop the program and, to date, is the sole recipient of such a grant. “Initially, it [OYEP] was envisioned to work with Youngstown and Warren schools, but I found the opportunity to expand its reach to work with other districts, as well as informal learning centers, such as the Public Library, United Way, Boys and Girls Club of Youngstown and Inspiring Minds,” Smith says. In the last year, she has been reaching out to these places and found that the teachers value entrepreneurship but didn’t feel qualified to teach it. “How do you teach them the skills and aptitudes to recognize market opportunities, to be critical thinkers, to collaborate, to communicate, to problem solve, and also learn the hard technical skills of what it really takes to run a business?” she says. The four programs launched in schools and organizations so far are Network for Teaching Entrepreneurship, WildFire Education, Biz 3D and Tech-E. The network was established in the 1980s to serve low-income, urban students who display entrepreneurial skills in grades six through 12. The program’s four-week pilot course will start in at least 10 high schools this semester, with many more expressing interest in incorporating the full-course curriculum next year, Smith says. The four-course unit focuses on recognizing opportunities, market research, the financial spectrum of business operations, and marketing and sales. At the end of the courses, students will present their business plans. One day this January, Terrana oversaw a training session for teachers at YSU where they engaged in the curriculum as both teachers and students so they could anticipate what their students are likely to experience when they present the material. 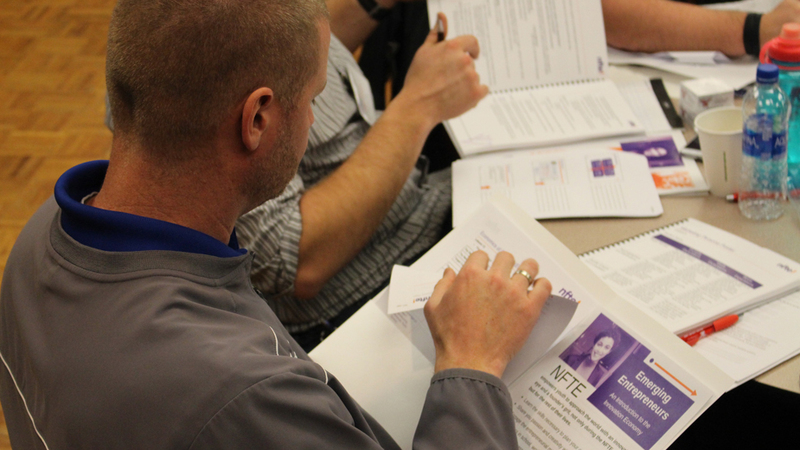 Pictured: Eric Sampson, director of the Utica Shale Academy, reviews a workbook used by the Network for Teaching Entrepreneurship. Wildfire Education started in Cleveland and is “another approach to entrepreneurship education,” Smith says. Howland High School will run a pilot course of the Wildfire Education in its junior and senior classes this spring, says Principal Sandy Williams. In the program, students will be put into groups and visit a nearby business to find out the problems or issues that company might have. They then will work to solve the problem for the business, turn in a project about it, then present a solution to the company owners. Biz 3D and Tech-E are after-school programs that focus on activities related to science, technology, engineering and mathematics, also known as STEM. Biz 3D is in partnership with the Youngstown Business Incubator and offers a blend of learning for 3-D printing and entrepreneurship. In this 16-hour program, students work together in teams to design their own items and create brief business plans before pitching their ideas. “These types of programs allow students to push those limits, fail and realize that the failure itself is a learning experiment and it’s not a negative or detriment, that it actually contributes to that growth mindset so important to students,” she adds. Biz 3D has been offered since last summer to students enrolled in college enrichment programs that include Upward Bound with Youngstown City Schools, Academic Achievers with Warren City Schools, Inspiring Minds, and a cohort of home-schooled students. “Research shows that when students are exposed to these types of activities in after-school settings, they are doing something they want to do and that translates to improved and enhanced performance in the school day,” Smith says. Inspiring Minds Youngstown, a youth enrichment program based on the Inspiring Minds program that serves students in Warren City Schools, is implementing the Tech-E program in Harding Elementary School. Pictured: Stephanie Gilchrist, Inspiring Minds Youngstown’s executive director. The program recently received $25,000 from The Raymond John Wean Foundation to offer after-school programs at 10 sites in Youngstown and Warren. “It has the component of technology and entrepreneurship, which is something our students need,” says Inspiring Minds Youngstown’s executive director, Stephanie Gilchrist. Tech-E programs range from simple engineering, such as how to grow your own garden, to a more advanced curriculum that involves learning coding and creating one’s own app. Pictured at top: Julie Michael Smith, the entrepreneur coordinator of the Center for Human Services Development at YSU.